Just wanted to give everyone a quick update. Last night we migrated all of the current FreePBX users to our single sign on server and turned on the single sign on system on this server. What this does is it gives you the ability to make comments in our new wiki (http://wiki.freepbx.org). We can also upgrade your privileges to make you a contributor as well so that you can update and change items in the wiki. From there we hope to provide more support for managing the newsletters we send out and what data you’d like to be able to control. We value you as our userbase and we are excited for the future of this project. If you can’t login to the wiki server with your forum account then you simply need to logout of the forum and relogin to the forum and you will then be able to access the wiki with your user account. 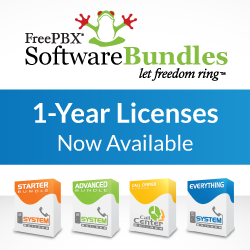 Previous PostEnable IM/Chat in FreePBX with the new XMPP Pro module!